In Canada and in the United States, a football is a ball, roughly in the form of a prolate spheroid, used in the context of playing gridiron football. Footballs are often made of cow hide leather, as such a material is required in professional and collegiate football. 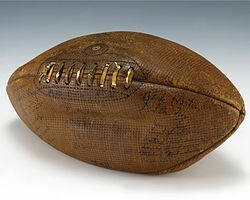 Footballs used in recreation, and in organised youth leagues, may be made of rubber or plastic materials (high school football rulebooks still allow inexpensive all-rubber footballs, though they are less common than leather). 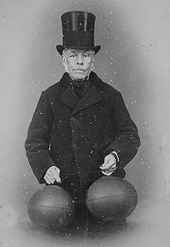 In the 1860s, manufactured inflatable balls were introduced through the innovations of English shoemaker Richard Lindon. These were much more regular in shape than the handmade balls of earlier times, making kicking and carrying easier. These early footballs were plum-shaped. Some teams used to have white footballs for purposes of night practice. Georgia Tech back Judy Harlan once spoke of Joe Guyon, a full blooded Indian, and his antics: "Once in a while the Indian would come out in Joe, such as the nights Heisman gave us a white football and had us working out under the lights. That's when Guyon would give out the blood curdling war whoops." The football changed in 1934, with a rule change that tapered the ball at the ends more and reduced the size around the middle. This new, sleeker ball made it much easier to handle, particularly for passers, while at the same time making the drop kick unreliable and obsolete. Hugh "Shorty" Ray, at the time a college football official and later the NFL's head of officiating, is generally credited with conceiving the pointed football. 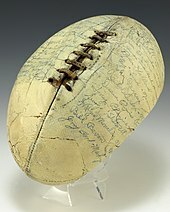 Early American footballs were essentially rugby balls, later redesigned to make them easier to throw. In this 1907 photo, Bradbury Robinson, who threw the first legal forward pass, demonstrates an "Overhand spiral—fingers on lacing"
Leather panels are typically tanned to a natural brown color, which is usually required in professional leagues and collegiate play. At least one manufacturer uses leather that has been tanned to provide a "tacky" grip in dry or wet conditions. Historically, white footballs have been used in games played at night so that the ball can be seen more easily; however, improved artificial lighting conditions have made this no longer necessary. At most levels of play (but not, notably, the NFL), white stripes are painted on each end of the ball, halfway around the circumference, to improve nighttime visibility and also to differentiate the college football from the pro football. However, the NFL once explored the usage of white-striped footballs – in Super Bowl VIII. The leather is usually stamped with a pebble-grain texture to help players grip the ball. Some or all of the panels may be stamped with the manufacturer's name, league or conference logos, signatures, and other markings. Four panels or pieces of leather or plastic are required for each football. After a series of quality control inspections for weight and blemishes, workers begin the actual manufacturing process. Two of the panels are perforated along adjoining edges, so that they can be laced together. One of these lacing panels receives an additional perforation and reinforcements in its center, to hold the inflation valve. Each panel is attached to an interior lining. The four panels are then stitched together in an "inside-out" manner. The edges with the lacing holes, however, are not stitched together. The ball is then turned right side out by pushing the panels through the lacing hole. A polyurethane or rubber lining called a bladder is then inserted through the lacing hole. Polyvinyl chloride or leather laces are inserted through the perforations, to provide a grip for holding, hiking and passing the football. Before play, according to the NFL rules, the ball must be inflated to an air pressure between 12.5 and 13.5 pounds per square inch (86 and 93 kilopascals). The ball weighs 14 to 15 ounces (400 to 430 grams). In the CFL the stripes traverse the entire circumference of the ball; its ball used slightly different dimensions prior to the 2018 season, when the league adopted the NFL specifications for its ball with the previous striping retained. The UFL used a ball with lime-green stripes. The XFL used a novel color pattern, a black ball with red curved lines in lieu of stripes, for its footballs; this design was redone in a tan and navy color scheme for the Arena Football League in 2003. Three indoor American football leagues; the Can-Am League, UIFL, and AIF, used a ball with red, white and blue panels. The USFL (1983–85) used the same Wilson football the NFL used at the time, with the only differences being the word markings and signature. The World Football League's football was a distinct orange color, said to be more visible during the night as most of that league's games would be played in the evenings. In an NFL game, the home club must have 36 balls for an outdoor game or 24 for an indoor game, and they must be available for the referee to test with a pressure gauge two and a half hours before the game. Twelve new footballs, sealed in a special box and shipped by the manufacturer, are opened in the officials’ locker room two hours and 15 minutes before the game. These balls are specially marked with the letter "K" and are used exclusively for the kicking game. The visiting team may also present 12 balls to the referee for outdoor games for inspection. Since 1941, Horween Leather Company has been the exclusive supplier of leather for National Football League footballs. The arrangement was established by Arnold Horween, who had played and coached in the NFL. Horween Leather Company also supplies leather to Spalding, supplier of balls to the Arena Football League. Despite the moniker "pigskin" sometimes used to refer to footballs, cow leather is used. ^ Trueman, Nigel. "Rugby Football History". Retrieved 27 July 2016. ^ Wiley Lee Umphlett (1992). Creating the Big Game: John W. Heisman and the Invention of American Football. pp. 141–142, 144, 148, 151–152. ^ Pearson, The People History -- Steve. "History of The Game Of Football Including The NFL and College Football". Retrieved 27 July 2016. ^ Seymour Smith (September 14, 1966). "Pro Football To Honor Ray: Rules Advisor's Ideas Gave Game Needed Boost". The Sun (Baltimore). p. C4. ^ Frassinelli, Mike (30 January 2014). "Why is the NFL football called The Duke?". NJ.com. Retrieved March 26, 2018. ^ Pees, Samuel T. "John Heisman, Football Coach". Oil History. Retrieved 2014-11-12. ^ Kerry Byrne. "'The Duke' is back!" (subtitle - "The white stripes")". Coldhardfootballfacts.com. Retrieved 3 August 2006. ^ "Rule 2: The Ball" (PDF). National Football League. Retrieved 29 January 2015. ^ "2018 NFL Rulebook | NFL Football Operations". operations.nfl.com. Retrieved 2019-03-26. ^ "Rulebook". Nfl.com. Retrieved 30 May 2011. ^ "The NFL's centenarians". Profootballhof.com. 7 February 2010. Retrieved 27 March 2013. ^ Scott Oldham (October 2001). "Bombs Away". Popular Mechanics. Retrieved 26 March 2013. ^ John Maxymuk (2012). NFL Head Coaches: A Biographical Dictionary, 1920–2011. McFarland. Retrieved 26 March 2013. ^ Barbara Rolek (27 October 2003). "Horween's leather bound by tradition". Chicago Tribune. Retrieved 27 March 2013. ^ Horween Leather Company. encyclopedia.com. Retrieved 26 March 2013. ^ Howard Wolinsky (May 16, 2008). "Horween Leather Faces an Uncertain Future". Business Week. Retrieved April 24, 2017. Wikimedia Commons has media related to American football balls and Canadian football balls.